Our universe is made up of visible matter, dark matter and dark energy. It is believed that the dark matter and the dark energy dominates the universe. Dark matter is something that we cannot see but still feel its presence through its gravitational effects. Dark energy is something we cannot perceive in normal ways but can infer by the rate at which our universe expands. A black hole is a type of dark matter but probably not the only one. We will limit our discussion here to ordinary matter that we can see and feel. Ordinary matter constitutes less than 5% of the total mass-energy available in the Universe! Let us leave the discussion about dark matter and dark energy to scientists who constantly strive to improve our understanding of universe. The two main constituents of ordinary matter are galaxies and intergalactic dust. A galaxy is a group of stars bound together as a gravitational system. The observable universe is made up of billions of galaxies. Each galaxy is believed to contain up to few billion stars. These stars orbit the center of their respective galaxy. It is believed that most or all of the galaxies house a black hole at the center. The massive black holes would be equal to millions of our Sun's mass. The black hole would thus become the focal point around which the galaxy takes shape. 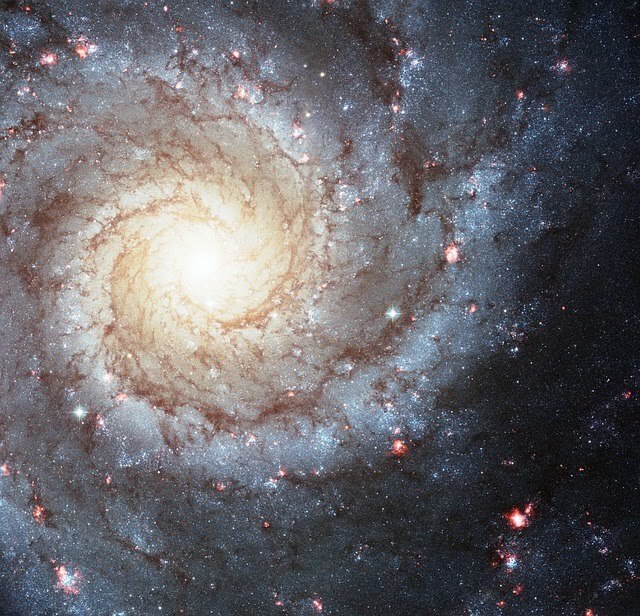 Most galaxies have a spiral shape extending out in the form of spiral arms. Our own milky way is a spiral galaxy. ​The image on the right is that of a face-on spiral galaxy named NGC 628. It displays its full face as viewed from Earth. It is located at a distance of around 30 million light years from us. 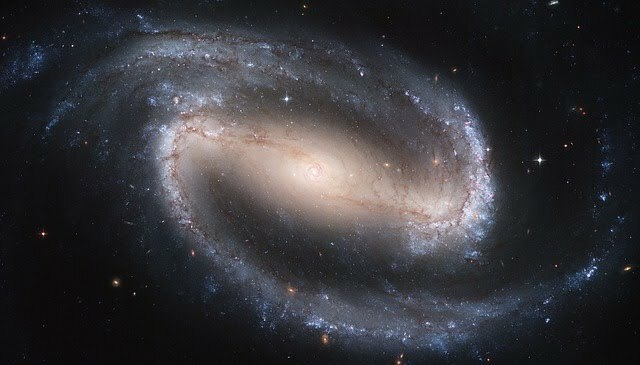 The image at the top is that of NGC 1300, a barred spiral galaxy. It is located at a distance of around 61 million light years from us. The stars on the outer arms take longer to orbit the central black hole as compared to those near the center. For instance, it takes our solar system around 250 million years to orbit the milky way galaxy once. In contrast, a star has been found closer to the center of the galaxy with an orbital period of just 11.5 years. This is less than the time taken by Jupiter to go around our Sun. The space between the galaxies is nearly empty but for the intergalactic dust. Not much is known about the intergalactic dust but quite a handful of such dust clouds are already detected in advanced observations.